I have long since thought that the perfect party would consist of about 50 different savory and sweet varieties of popcorn. Just that. Popcorn. Oh, and maybe some water or another simple beverage. I’m so fancy, I know. But I love, love, love popcorn. Not just the simple, buttered kind, but I adore other savory styles of popcorn, too, and this Chile Lime Popcorn is just about the tastiest set of kernels I’ve ever eaten. 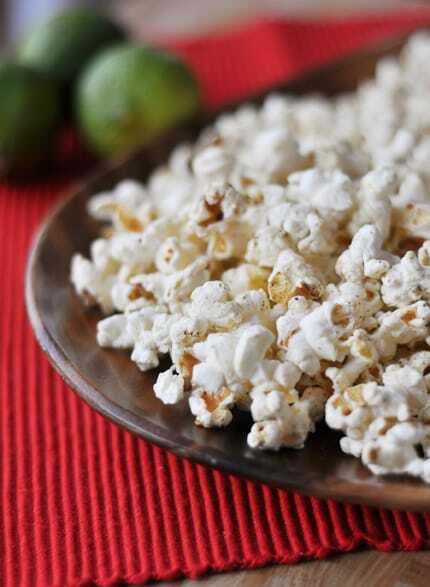 Infused with a subtle lime flavor and tossed with gentle smoky spices, this light, buttery, spicy snack is a great way to change up serving regular ol’ popcorn. A bowl full of this magical popcorn would be perfect alongside any appetizer, dessert spread, or served for movie night or game day. Preheat the oven to 300 degrees F. Line a baking sheet with foil, silicone baking mat or parchment paper. Set aside. Put the popped popcorn in a large, clean paper bag or a jumbo-sized ziploc bag (which is what I used). In a small bowl whisk together the butter and lime juice. In another small bowl combine the lime zest, black pepper, salt, red pepper, and cumin. Drizzle half of the butter mixture over the popcorn, fold over or close the top of the bag, and shake until the popcorn is coated and moist. Taste. Add more of the butter mixture if you like, and give a second shake. Sprinkle most of the pepper mixture over the popcorn, fold over or close the top of the bag, and shake a few times to coat. Taste, and if you'd like more pepper flavor add the rest of it. Toss to combine. Spread the popcorn evenly over the baking sheet and bake until the popcorn is dry, 5-7 minutes. Store in an airtight container until ready to serve (this is best served within a few hours). I also wanted to add that I loved the popcorn as “hint of lime” popcorn with just the line juice/butter, some lime zest and salt. I can easily see myself making that version more often. Nevermind the baking, just toss and eat. That might become a “regular” in my just-watching-a-movie popcorn flavors. You are right, this is tasty stuff! Not fancy or mind blowing, but definitely delicious! It’s perfect for when the munchy craving hits but you don’t want sugar (or the sugar crash that follows!). Yummy and different, and that’s a win in my book! 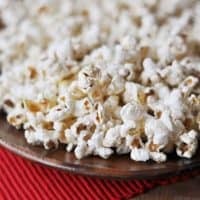 I love your cinnamon roll caramel popcorn, but when I needed a non-sweet popcorn for a popcorn party (not with 50 flavors, but with 6), I knew this was one to try – and it was a hit! Thanks for all your great recipes. Hmmmm very interesting. We haven’t ventured too far into popcorn other than sprinkling some garlic powder and parm cheese on it. I love love LOVE that you’re doing the reinvented sugar rush!! Okay Mel, when you have a popcorn party, I am so coming! I love popcorn, in fact it’s embarrassing how much popcorn we eat at our house. Can’t wait to try this recipe! I can never, yes NEVER, get enough popcorn. I agree it would make up the perfect party. I have been seeing so many fun, and tasty popcorn recipes just in the last couple of weeks or so – a trend that makes me incredibly happy. Thank you! I completely agree that the perfect party would consist of just popcorn. It is my favorite snack. I also have to break down and get the 3-flavor popcorn tins they sell at Christmas time. Nasty, I know, but I can’t help it! Love 101 cookbooks and this is something I have not tried. 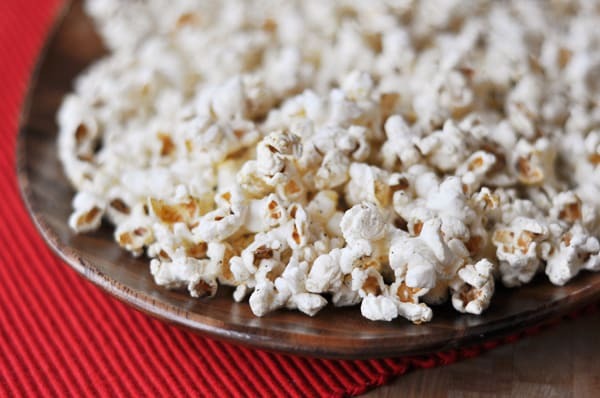 Newman’s Own popcorn is a great choice for this recipe to keep it “natural” if you don’t have an air popper. I just bought a popcorn maker for my hubby for Christmas…pretty sure it’s one of the gifts you are secretly buying for your own use! !